Are you on Pinterest? 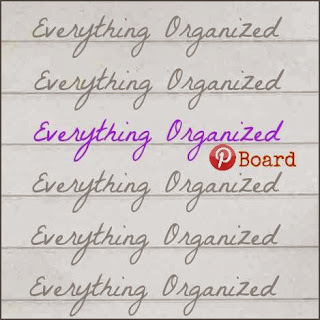 Do you love finding great organizing ideas and re-pinning them? Then today is your lucky day! Even if you're not on Pinterest, keep reading because you'll be able to enjoy this too! 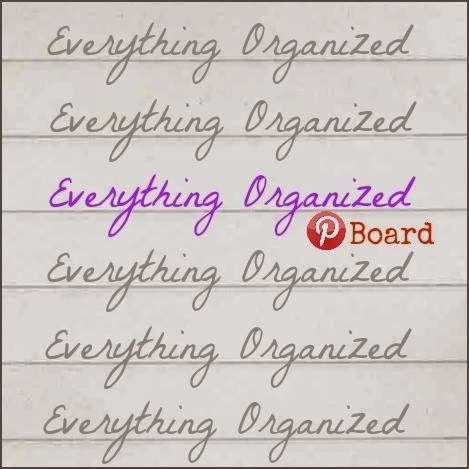 I've joined forces with several other fabulous organizing bloggers on a group board called Everything Organized. So follow this great board to make sure you never miss any of our pins! Then pin away and use these posts to get everything organized! Which pin is your favourite so far? Which pin will you implement first? My desk drawers annoy me--especially the ones where I keep pens, clips, etc. How do I figure out what is the best thing to buy to organize all these little bits--and then where to buy it? You can also find lots of desk drawer organizing ideas on my Office Organizing board http://www.pinterest.com/organizerhilda/office-organizing/. If you want to buy desk organizers they have them at Staples, Walmart, Target, etc. Or, you can often make your own desk organizers using items you have around the house. There are some ideas on my DIY organizers board http://www.pinterest.com/organizerhilda/diy-organizers/. Good luck organizing your desk supplies! Profitable Organizer's Black Friday Preview! Want to Get Paid To Organize? Organize Stuffed Animals On the Back of a Door! A Little Piece of Organizing Heaven! I've Made Some Changes On This Blog!